Can Chapter 7 or Chapter 11 Also be Used to Stop Foreclosure? although Chapter 13 is correctly known as the most common type of bankruptcy to stop a foreclosure, it is not the only type of bankruptcy proceeding that will create an automatic stay. Chapter 7 liquidation bankruptcy filings will also stop a foreclosure as will a Chapter 11 reorganization, and in some cases these other types of bankruptcy filings may be appropriate. If you have fallen behind on your mortgage payments and you want to surrender your home as well as wipe out your other debts, Chapter 7 may be a viable option. As is the case with Chapter 13, when you file a Chapter 7, the automatic stay goes into force and any pending foreclosure must stop. Assuming that your Chapter 7 Statement of Intentions provides for a surrender of your home, the mortgage lender will need to file a Motion for Relief from Stay, wait for a hearing on the motion (3 to 6 weeks), then restart the foreclosure process (4 weeks). Thus, Chapter 7 would not only eliminate any personal liability that you might have from an unpaid mortgage, but a filing would give you time to get your affairs together and find a new place to live. Although Chapter 11 is best known as a business reorganization bankruptcy, it can be used by individuals to reorganize. In fact, Chapter 11 is the only option to reorganize if your debts exceed the debt ceilings currently in force under Chapter 13 (no more than $336,900 0f unsecured debt and/or $1,010,650 of secured debt). Chapter 11 operates similarly to Chapter 13 in that the debtor prepares and files a plan of reorganization that has to be confirmed (formally approved) by the Bankruptcy Judge. Chapter 11 is somewhat less practical for most people because of its cost – the filing fee alone is currently $1,039. Attorneys fees for Chapter 11 are also much higher than Chapter 7 or Chapter 13 consumer bankruptcy fees. Can Chapter 7 Stop a Pending Foreclosure?? A Chapter 7 bankruptcy filing will stop a foreclosure because a filing will trigger the imposition of the automatic bankruptcy stay. Of course, Chapter 7 does not function as a repayment plan like Chapter 13 so Chapter 7 does not provide for a repayment of missed mortgage payments over time like Chapter 13 does. It does not matter that your Chapter 7 “Statement of Intention” provides that you intend to surrender your home. Your Chapter 7 filing will create an automatic stay and legally bar a mortgage or judgment creditor from proceeding with a foreclosure sale. In rare cases, Chapter 7 does serve to give debtors time to catch up their payments or proceed with a refinance or even a sale. Occasionally we meet with clients who have filed Chapter 7 cases on their own, without the advice of an attorney, or using a petition preparation service. This is usually not a good idea as Chapter 7 cases cannot be dismissed voluntarily once they have been filed – instead any motion to dismiss a Chapter 7 must be heard by the judge and approved. In cases where there is equity in a home over the outstanding mortgage the judge may not agree to a voluntarily dismissal and the trustee will take possession of the home to sell it. For this reason, Clark & Washington recommends that you never file a Chapter 7 pro se (on your own, without the help of a lawyer) or using a non-lawyer petition preparation service. Click on the link to learn more about how you can determine whether your house is currently in foreclosure. What are the Requirements to File a Chapter 7? As of October 2005, when new bankruptcy laws were passed, there are more stringent requirements in place for those wanting to file for Chapter 7 bankruptcy. These new bankruptcy requirements and laws were put in place as a means of limiting abuse of the Chapter 7 bankruptcy system by people wanting to quickly eliminate debt. Essentially, the bankruptcy laws of 2005 make it harder to qualify for a Chapter 7 if you have an income sufficient for filing for Chapter 13 – which is more a reorgination of debt, as opposed to Chapter 7’s elimination of debt. Before filing for bankruptcy – be it Chapter 7 or Chapter 13 – you must first take what is known as the means test. The means test is a two part financial evaluation which will determine whether or not you qualify for Chapter 7 or Chapter 13 bankruptcy. If it is determined that you have the “means” to file Chapter 13, then you will be required to do so. Otherwise, you will be eligible for Chapter 7 and can commence with the filing process. Once you have taken the means test and it has been determined that you are eligible to file for Chapter 7 based on your income levels, you will also have to obtain a credit counseling certificate before filing bankruptcy. The credit counseling requirement is yet another stipulation of the tougher bankruptcy laws and requirements enacted in October 2005. To get the certificate, you simply have to attend a credit counseling class. The class typically lasts 45 to 90 minutes, costs no more than $50.00, and must be completed within the 180 days immediately preceding the filing of the Chapter 7 bankruptcy petition. You will file your credit counseling certificate along with your Chapter 7 bankruptcy petition. A list of all of your debts: This list will need to include creditors, lien holders, and even friends or family who have given you personal loans. Documentation proving your income: To substantiate your income, you will need to provide the last seven months of pay stubs, income statements, and the last two years of your income tax returns, if filed. Monthly expenses: Be sure to document what your monthly “cost of living” is. Documentation regarding the value of your assets: also required when filing for bankruptcy. Disclosure to the Bankruptcy Court as to whether or not you are a party in a pending lawsuit or have been a party to a lawsuit in the last year. After filing your petition for Chapter 7 bankruptcy, you will also be required to attend a “financial management course.” This course will generally be available through the same agency as the one which offered your credit counseling class. The financial management course must be taken before you will be able to receive a bankruptcy discharge for your debts. Because filing for Chapter 7 has gotten more and more complex since the laws have changed in 2005, it is always important to seek counsel from a licensed and seasoned bankruptcy attorney before filing. 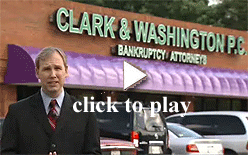 The attorneys here at Clark and Washington will be more than willing to help you make sure you meet all of the requirements to file and direct you though the intricacies of the Chapter 7 bankruptcy process. 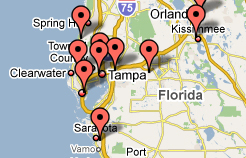 Should I Consider Using One of Those Foreclosure Prevention Companies that Advertise on TV or Radio? Like you, the attorneys and staff of Clark & Washington hear those radio and tv ads from “foreclosure relief” or “foreclosure prevention” companies. These businesses claim to have the information that “the mortgage companies don’t want you to know” and promise that they can stop foreclosures even after advertising has started. Clark & Washington’s senior attorneys advise you to be very careful when dealing with a “foreclosure relief” company. While some of these businesses may be legitimate, there are many that operate on the fringes of the law. research the company on Google or Yahoo. Do they have a web site? Have others posted opinions or reviews about their work? We know from our dealings with mortgage company default offices, that once a home goes into foreclosure the lender becomes more and more reluctant to stop the foreclosure process. This is especially true if you do not have a lot of money to bring to the table. Don’t let promises and fast talk stop you from at least investigating the bankruptcy option. What are the Requirements to File a Chapter 13? Chapter 13 bankruptcy functions as a three to five year payment plan that is supervised and approved by a bankruptcy judge and and a bankruptcy trustee. Unlike voluntary payment arrangements, bankruptcy court approved Chapter 13 plans bind all creditors – they have to accept the terms and the payouts set out in the plan. Your Clark & Washington lawyers have years of experience preparing Chapter 13 plans that will meet court approval but also leave you with enough money to pay your bills and live your life as you see fit. You must also have enough “disposable income” left over at the end of the month to pay into your Chapter 13 plan. You might be surprised to learn exactly how much disposable income you actually have after your Clark & Washington lawyer works with you to prepare a budget and proposed repayment plan. You must be a living person to qualify for Chapter 13. Corporations and estates of deceased persons do not qualify. There are a few other requirements that affect people who have previously filed Chapter 7 or Chapter 13 (ask your lawyer) but as you can see, the requirements to qualify for Chapter 13 are fairly reasonable. If you think that Chapter 13 may be appropriate for you, please call our office for a free, friendly consultation. Our telephone number is 770-488-9300. What Documents and Information do I Need to Start Chapter 7? When you determine you will be filing for Chapter 7 bankruptcy, being prepared is of the utmost importance. Navigation through the Bankruptcy Code has become more complex in recent years and has made it more difficult for a debtor to file for Chapter 7 bankruptcy. In 2005, the Bankruptcy Abuse Prevention and Consumer Protection Act (BAPCPA) was enacted to discourage unwarranted bankruptcies and protect both creditors and consumers. However, because of the BAPCPA, there are extensive documentation requirements, debt/income qualifications, and responsibilities the debtor must fulfill to file for bankruptcy at all. For these reasons, it is always best to hire a bankruptcy attorney to help get you through the bankruptcy process. With the enactment of the BAPCPA, it is now required that all debtors filing for bankruptcy must have first attended a credit counseling class. The certificate of completion of this class will be filed with your petition for bankruptcy. The class is low cost, with $50 being the maximum amount the law allows a debtor to be charged, and in some circumstances the fee for the class can be waived. During this class, a credit counselor will review and assess the debtor’s financial situation and recommend solutions for getting out of debt. This class must be taken within 180 days prior to filing your petition. Before filing, you must also compile a list of all of your debts. This list will need to include creditors, lien holders, and even friends or family who have given you personal loans. An easy way to go about getting most of this information is to request copies of your current credit reports. Many debts with the current amounts owed will be listed on these reports and can make the creation of your list much easier. The three major credit reporting agencies are Equifax, TransUnion, and Experian. It is important to obtain a credit report from each of these agencies, as different debts can be listed on each. For the rest of your debt information, you will need to make use of your personal records to ensure your list of debts is complete. It is very important that every debt is accounted for because, if you forget a debt and your bankruptcy is completed, that debt will not be a part of the bankruptcy discharge and you will be held liable for the full amount owed. When filing for bankruptcy, you will also need to provide documentation proving your income. To substantiate your income, you will need to provide the last seven months of pay stubs, income statements, and the last two years of your tax returns, if filed. These documents will not only verify your income, but will be used to determine whether you are even eligible to file for Chapter 7 in the first place (via the “means test”). Along with the proof of your monthly income, you must also report your monthly expenses. Documentation regarding the value of your assets is also required when filing for bankruptcy. When determining the value of your assets, you will value them at what they are worth now, not what you bought them for. The easiest route is to hire an appraiser to perform an appraisal; however, if you can’t do this, you must be able to prove the value you have determined is “fair market value.” Your assets will include your household items, real property, and any items that may be sold to pay creditors. Additional items which must be valued as assets include stocks, retirement accounts, and business interests. To ensure that you report everything required, confer with your bankruptcy attorney. You will also need to disclose to the Bankruptcy Court whether or not you are a party in a pending lawsuit or have been a party to a lawsuit in the last year. It will also be necessary to report the current status of these legal matters. This is important because in the event the lawsuit is still pending when you petition for bankruptcy, an automatic stay will be granted on the proceedings and your debt, if any, in the lawsuit may be included in your bankruptcy. Can I Keep my House if I File Chapter 7 to Stop a Foreclosure? There is nothing preventing you from keeping a house after you have stopped foreclosure by filing a Chapter 7. However, as a practical matter, most mortgage companies will not “reaffirm” your mortgage debt if you are behind with your mortgage payments. Chapter 7 is a liquidation type of bankruptcy, rather than a personal financial reorganization like Chapter 13. If you are behind on your mortgage payments when you start your case, there is no court payment plan in Chapter 7 that will allow you to catch up. However, if you file Chapter 7 to stop a foreclosure so that you will have time to sell your house or refinance your mortgage, Chapter 7 can be a useful tool. Generally, you would not use Chapter 7 to save your house long term. Chapter 13 is more appropriate to accomplish that purpose. However, Chapter 7 can be a very powerful tool that will allow you to stop a foreclosure, walk away from your house and mortgages with no financial penalty and to get rid of your credit card and unsecured debts as well. As is the case with any type of bankruptcy relief, you should seek professional help in the form of an experienced bankruptcy law firm like Clark & Washington. You are always welcome to call our office for a friendly, free consultation. Our phone number is 770-488-9300. Thus, the key difference between a Chapter 7 and a Chapter 13 is that in the former, the debtor’s assets (home typically included) are used to pay off debt, while in the latter, the debtor makes payments over time in order to keep his/her assets (home included). People often use Chapter 13 as a means of avoiding foreclosure (create link).